We have pre-booked rooms at two hotels. To see where the hotels are located, please click on hotel map. A limited amount of rooms have been booked at the brand new Radisson Blu Riverside Hotel in the immediate proximity of the conference venue in Lindholmen Science Park. The booking has been made by our congress organizer Congrex Sweden AB and the rooms are available at first-come first-serve basis. Please tick your preferred hotel option in the conference registration form and pay with credit card or bank transfer. Hotel rooms shall be pre-paid in conjunction with the online booking. Rates include breakfast and VAT. A limited amount of rooms have also been booked at the Grand Hotel Opera near the Central station in Gothenburg, 8 minutes by bus from the conference venue. The booking has been made by our congress organizer Congrex SwedenAB and the rooms are available at first-come first-serve basis. Please tick your preferred hotel option in the conference registration form and pay with credit card or bank transfer. Hotel rooms shall be pre-paid in conjunction with the online booking. Please tick your preferred hotel option in the conference registration form and pay with credit card or bank transfer. Full hotel pre-payment is required to guarantee your hotel reservation. No room can be guaranteed until Congrex Sweden AB has received your hotel pre-payment. You are welcome to make your hotel request at any preferred time by e-mailing your request to us, but kindly note that there are limited numbers of rooms available. 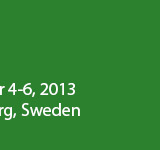 Congrex Sweden AB cannot guarantee room reservation for hotel requests received after August 16, 2013. Cancellation of hotel reservation must be made in writing and sent to Congrex Sweden AB. - Cancellation of any hotel nights reserved will be accepted until 19 July, 2013 and the total amount will be refunded except a cancellation fee of SEK 250. - For cancellation received after 19 July but before 2nd August, 2013 the hotel pre-payment, except one nights' accommodation, will be refunded. - Should you cancel your reservation after 2 August, 2013 or if you arrive later or leave earlier than on the dates indicated on your reservation form, the total accommodation amount will be charged and no refunds can be made, as the hotel will charge no-show costs. If your reservation goes to no show i.e. you never cancelled or arrived at the hotel you will be charged for the total amount of your accommodation. All refunds will be made after the conference.